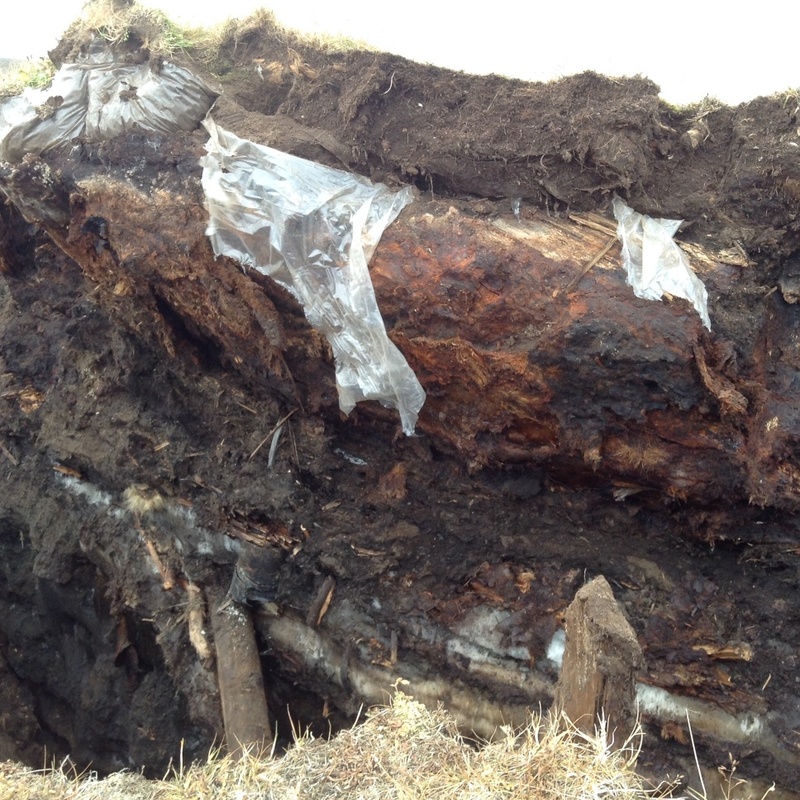 We were able to run a pair of C14 dates on materials from Deering as part of the WALRUS project. I just got the results back today. I have to share the calibrated dates with the folks in Deering first. They were kind enough to let me include the samples, which were found during the monitoring work we did there late last summer, in the WALRUS studies. They were found together in a fairly thin organic layer (likely midden) in the wall of one of the trenches. Very little walrus has been found there, so we were lucky. 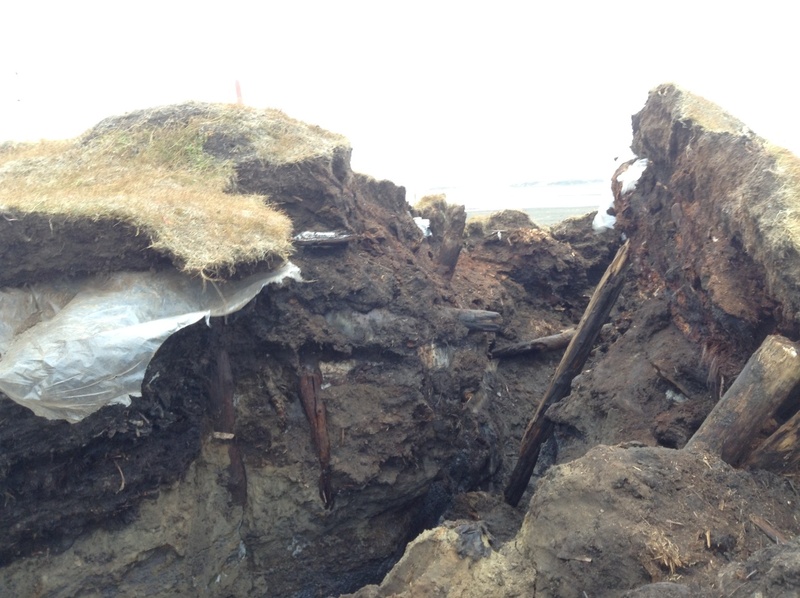 Samples were from the upper dark layer visible in the trench wall. The trip to the conferences went well. I really didn’t have much time at SAAs to even see friends, if they weren’t in one of the sessions I was involved in. Then it was off to Prague for a session at Arctic Science Summit Week. It was a great session, although we were put into a tiny room, which the participants in the session nearly filled, so a lot of non-archaeologists wound up peeking in and moving on. Peter Jordan who got me involved in the session, and Sean Desjardins, are guest editors for a special issue of Quaternary International which will publish papers from this and a previous session. I seem to have promised them two! I didn’t have very long in Prague, but did get a chance to catch up with Vica Lozinschi, a former BASC intern who helped with some salvage at Nuvuk. She is married and living in Prague now. We only had a morning, but she took me to see some of the sights (some literally “see” from afar since I had a lunch meeting afterwards!). Vica sampling an adult beverage which the Czech people claim to have invented. Me also sampling said adult beverage. My grandfather owned a brewery, so it is of more than passing interest. Once I got back from Prague I have been writing proposal language, and papers almost non-stop. For some reason, most of the handbook/encyclopedia type volumes I have contributions in are doing new editions this year, which means the articles have to be revised and updated. Several other articles have reached the proofs stage and need to be gone through. Then there is a dissertation committee I am on. That meant I spent last weekend reading the dissertation, and am now trying to find a time when the entire committee can meet (several of us on Skype) to discuss. I am also working on final radiocarbon calibration and modeling for the WALRUS project, with a deadline due to one of the students having a presentation at the end of the month in which he wants to use my results. There were a few problems with the master database, now resolved. I’ve got all the dates calibrated, haveHarris Matrices built for all but two of the sites, and am using them to check my radiocarbon modeling against. I’ve spent all day today and will spend part of tomorrow on a site with a big wiggle in the calibration curve that pretty much seems to fall right at the period of occupation, so that’s annoying. I’m also trying to pull the Walakpa salvage project together. This is a site with a deep history that was used up until very recently, and is still visited regularly by folks from Utqiaġvik. It would be a real shame if the structures we found last year just eroded, and at the rate things are going, normal funding channels simply are not fast enough. This has all kept me pretty busy, and last week I had dental surgery. I was supposed to get an implanted post that a crown would go on after it healed, but apparently my bone hadn’t grown into the socket in a way to suit the dentist. So he routed a bunch of it out (hate that crunching sound in your head) and did a bone graft, so now I have to wait four months and maybe then get the implant. Sigh. After a rather long, drawn-out saga, everything is in place and I can draw on funds so I can work on the WALRUS project. The delays have been really frustrating for everyone involved. Once I get the interns on board in Barrow, we’ll get back to going through the faunal material we have there for walrus samples. We are trying to get samples from a wide range of sites. 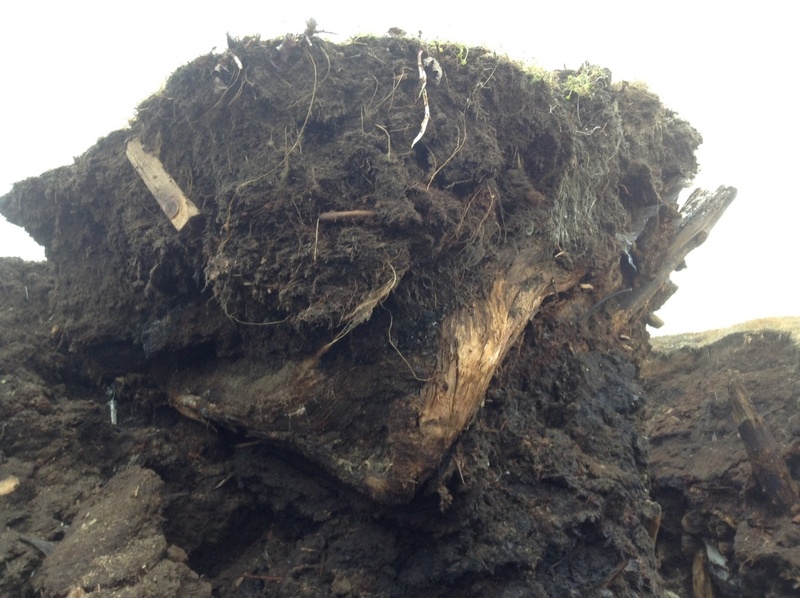 Since the sampling is destructive, we don’t want to use artifacts if that can be avoided. Ideally we want unmodified walrus parts, bone or tooth, or if we can’t get enough of them, manufacturing discards. As a fallback, we may wind up sampling things like shovels or bola weights, assuming we can get the museum’s permission, since they are common types of artifacts, and not diagnostic (or something that is likely to be displayed). We currently can’t use tusk parts, since there have been no modern studies to compare their chemistry to that of bones and teeth, so interpretation of results would be problematic. (If any carvers would be able to contribute some scraps from tusks along with a sample of bone and/or a tooth from the same animal, it would be a really big help). We are also looking for caribou or some terrestrial plant material from the same place in the site for radiocarbon dating, since marine mammals incorporate old carbon and the dates are hard to interpret. More recent archaeological projects tend to have excavated faunal material in the same way as everything else, with decent stratigraphic control, and also tend to have brought it back from the field. However, in the early days, that was not often the case. Even if material was brought back, it often wasn’t cataloged in any detail, so reports are almost no help in figuring out if there is any walrus to be had in archaeological collections. A bit of walrus shows up in catalogs, but most of it is in the form of artifacts. A lot of walrus artifacts (particularly bone, since ivory was clearly an item of trade) suggests that the inhabitants of a site were hunting walrus, so the potential for walrus parts to exist in the collection is there. 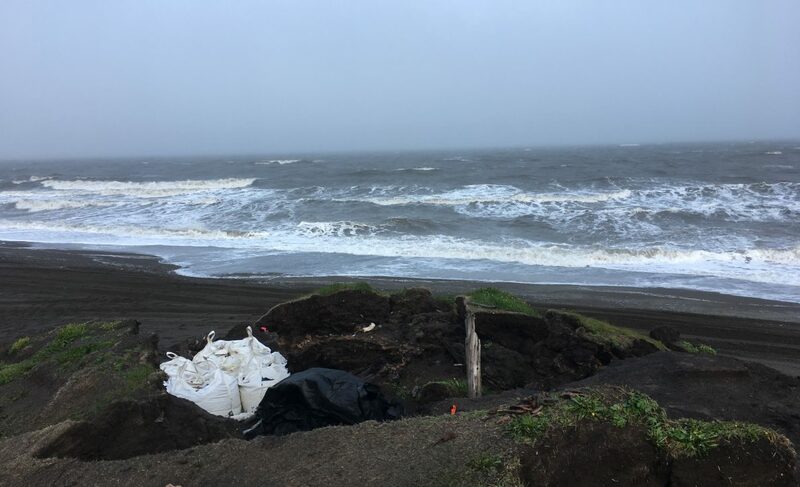 Many of the classic sites on the coast of Alaska have strong indications that walrus were being caught by the people who lived there, but they were excavated decades ago, and finding suitable samples in the collections was not something that could just be done by getting someone to pull a particular bag or catalog number. It pretty much requires looking through mixed lots of artifacts and bags of bones. So I’m in Fairbanks doing just that. 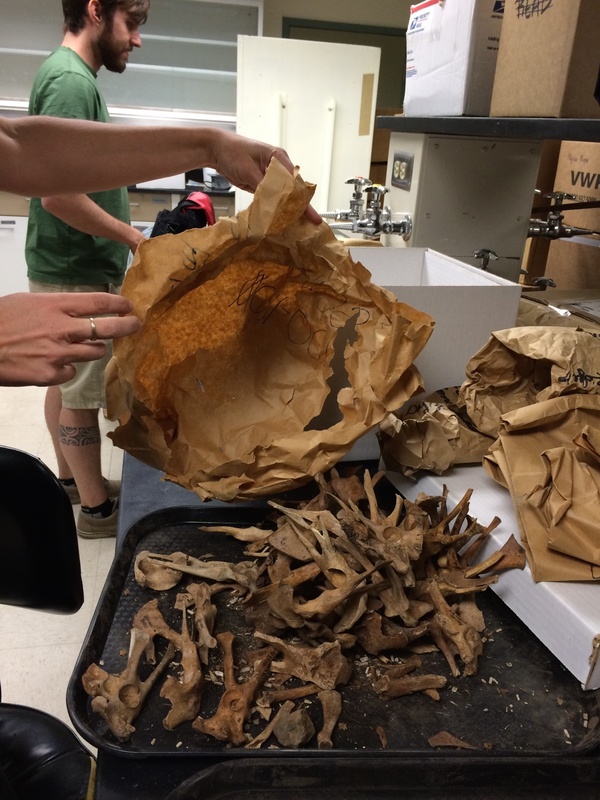 Nicole holds a bag from which the bones on the tray burst forth (like a scene from Alien) when she took it out of the outer bag. Sadly, these were almost all ringed seal parts. Other bags from that box are on the right. Not all of the bags were correctly labeled, or at least the labels often didn’t specify species, just element, so we had to look. 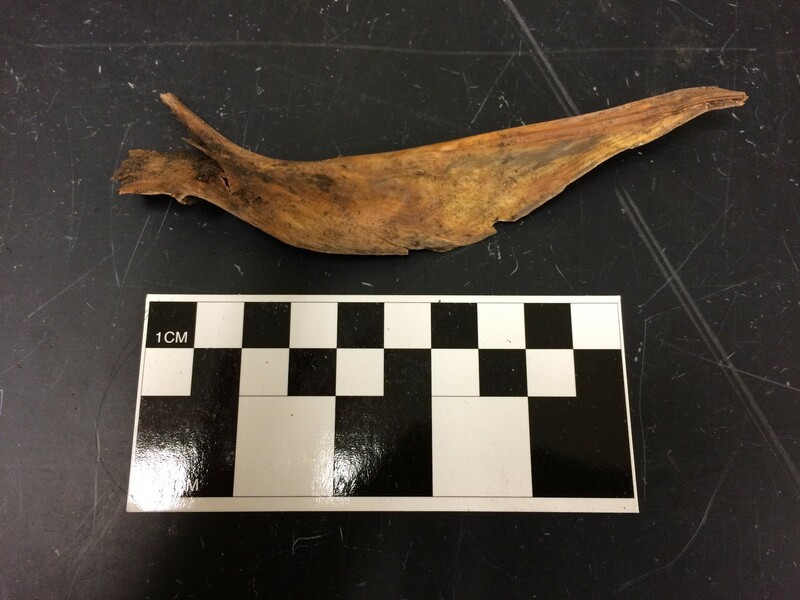 We found a few other interesting things in the process, including this really large fish bone from Point Hope. The other side of the really big fish bone. I’m pretty sure it’s some sort of cod (Gadid) but exactly what sort? It’s really big. If I have time, I’ll talk to the curator of fish, but the mission is walrus samples at the moment. We are seeking students (high school or college) to work in the archaeological laboratory on artifacts as part of several NSF-funded research projects. 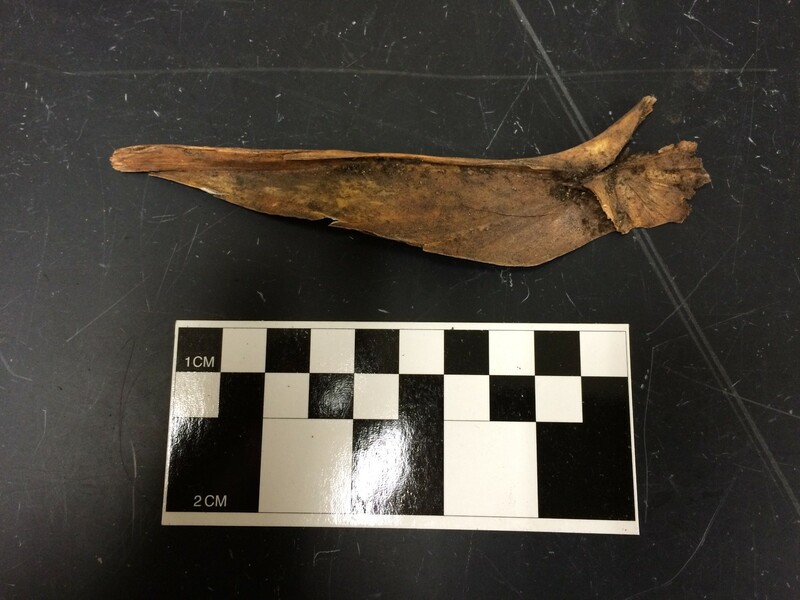 The lab crew will be working on processing artifacts excavated at Nuvuk, Walakpa and other North Slope sites. This will involve cleaning (gently), sorting, marking, cataloging and preparing some items for transfer to a long-term repository. We will also be going through and sorting some frozen organic samples from an earlier project in Barrow that have been sent back from New York State. We also will be attempting to find walrus bones in these collections for analysis at UAF. There is a possibility for student travel in connection with that project. You do not need any prior experience; we can train you. Many archaeology crew members start as high school students. Once you learn how to do the work, scheduling can be very flexible. If you have skills in drawing, photography, or data entry, we can really use your help as well! Starting wages will depend on experience and qualifications. To apply, send a resume and cover letter to Anne Jensen, anne.jensen@uicscience.org as soon as possible. You can use the contact form below for questions. I have gotten far enough along in getting over the back surgery that I finally have enough energy to do things that are not strictly essential for work or staying fed. So we are ramping things up in the lab. We are looking for a few more people to work in the lab here in Barrow, joining the current crew on weekdays or weekends. Due to the source of funding, these folks will need to be high school or college students. We are also looking for volunteers. I will post the announcements on here a static page and also as posts. We aren’t sure yet if we will have funds available to do fieldwork this summer, but we are hopeful. If we do get into the field this summer, people who have lab experience will have priority for fieldwork jobs. If you are interested, please contact me ASAP. Please pass this on to anyone you know who might be interested.